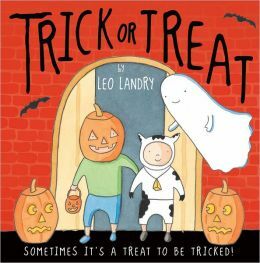 Trick or Treat is a fun picture book for kids whether they have it read aloud or are able to read it independently. Second grade level readers should have no problem reading independently and the illustrations and the twist at the end of the story will keep them engaged and turning the page. Teachers will appreciate this addition to the first or second grade classroom library especially during the month of October because it is such a fun Halloween book with a hint of scary without being offensive to parents or too frightening to the reader. Trick or Treat is a wonderful example of a story that has levels of comprehension and meaning told with few words. It is not just an ordinary Halloween party story but a party with unexpected human guests. The fact that the main character was not expecting two children to appear is just one fun twist to what the author shares throughout the story. The book offers the teacher an opportunity to ask great questions of the reader to test second grade reader comprehension and also to encourage students to write their own fun Halloween stories. The ending itself offers much room for classroom discussion because it leaves the main character in a cliff hanging predicament, a perfect time to ask the students what they would do. From the invitation on the jacket flap to the hysterical twist at the end of the story, the story will be enjoyed by adults and the young readers who master the pages.